SMART CUT™ Resin / HYBRID SCH series New Generation & Technology Dicing Blade is the highest performance dicing blade available today. Developed in response to customer demand for Reduced Wear Resin Bond Blade. After years of Research & Development and testing we have created HYBRID BOND dicing blade. SMART CUT™ Resin / HYBRID SCH series lasts longer than any resin bond diamond dicing blade and maintains better form & shape consistently through its life. Between METAL BOND and RESIN BOND. Works like a resin, lasts like a metal bond. Designed to replace the conventional resin bond diamond blades. longer lasting - will outlast conventional Resin Bond Dicing Blades 3 to 1 or 4 to 1. SMART CUT™ Resin / HYBRID SCH are more sturdy than blades manufactured with conventional technologies. Unlike many other resin bond blades, they will not dull and maintain its firm shape and roundness all the way through the blades life. more universal - SMART CUT™ Resin / HYBRID SCH Dicing Blades can accommodate higher loads and feed rates. And may be used on both low & high power saws. Exhibiting unmatched Stability, Flexibility, & Conductivity. no glazing – blade requires minimal dressing, the bond renews itself. faster cutting action – More aggressive than your ordinary blades. They cut faster, still leaving behind a smooth finish as you would expect from a resin bond. maximum coolant absorption – SMART CUT™ Resin / HYBRID SCH open bond design allows diamonds to absorb excessive heat and tension generated by repeated use, promoting consistency in cut cleanness and smoothness. You will notice the difference in the quality of the cut these blades leave behind. 1.) blade will not loose its roundness or shape - A resin bond, is really tar in a solid form. And in many cases, must be constantly dressed. Constant dressing often results in blade loosing its roundness and becoming oval shaped. 2.) no material contamination & deformation - A resin bond must remain very fragile in order to expose new diamonds. For this reason, strong and high quality diamonds cannot be used in a resin bond. High quality diamonds are harder than a resin bond matrix, and would soon disintegrate the bond that keeps them in place. For this reason, diamonds that are used in a resin bond are poor to medium quality. Most of them disintegrate or fall out of the bond, before they have a chance of being used. 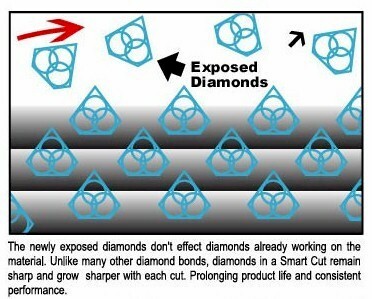 The problem with this approach is these diamonds fall into the material being dicing, causing unwanted contamination. The bond most widely used with diamond dicing blades is a resin bond. It is made of a tough polymer formed to hold the diamond particles to the rim of the dicing blade. Resin-bonded dicing blades remove material quickly. However, most resin bond dicing blades wear too fast. They also require frequent dressing (truing) to hold their form. A stronger bond type is a sintered (metal bond). Metal Bond dicing blades offer longer life & better form retention than resin bond dicing blades, and can be operated at higher speeds. Yet any users find that sintered (metal bond) dicing blades cannot be utilized for their application due to their requirements for edge quality/surface finish. Compare to any other Resin Bond Dicing Blade. START SAVING TIME & MONEY TODAY! Contact us for Free Quote & application recommendation. We will work with you to determine your needs, and recommend the right parameters for your specific material/application. 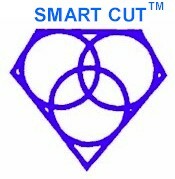 If you are not using SMART CUT™ Resin / HYBRID SCH series, you are loosing money & missing out on incredible performance. SC1H - SMART CUT 1H (Hybrid), High Concentration. 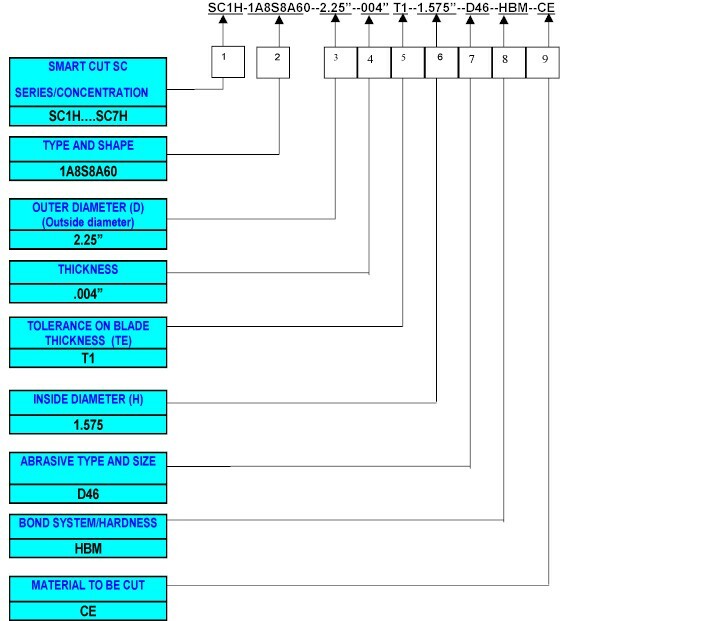 1A8 S16 A60 - 1A8 - Shape of the blade; S8 - slot quantity on the blade 8 slots. Blades can be produced from 4 to 24 slots; A60 - angle size 60 degree of cutting edge, we can produce any other angle, please specify. For blades without slots and angle shape designation is: 1A8. 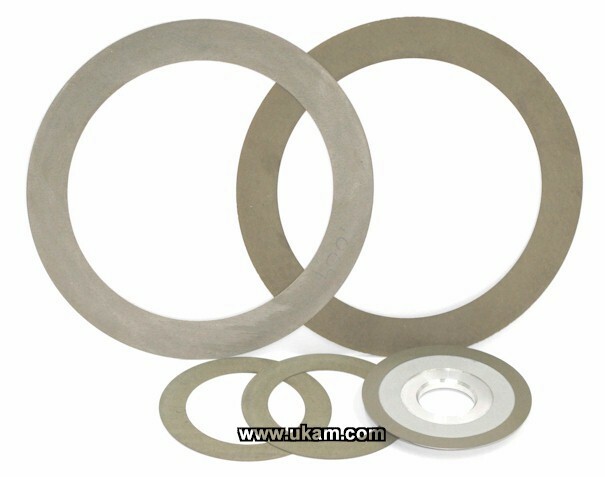 2.25”- Outer diameter (D) dicing blade 2.25 Inches; Tolerance for all outer diameters dicing blades: +/-.002”, Any Tolerance can be produced per your request, please specify. 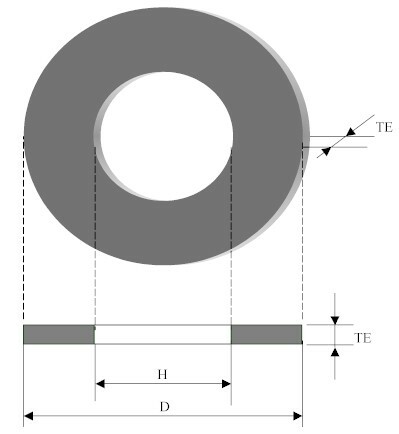 TE- Thickness of the blade is .004”, blade thickness available in .0001” increments. H - Inside diameter of the blade is 1.575”. 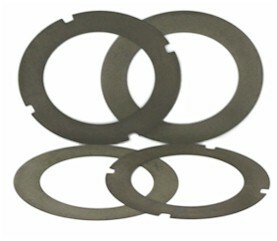 D46 - (Abrasive particle size for smart cut (SC) series dicing blades): Diamond size 325/400=D46=45/38µm. CE- material to be cut: CARBIDE TGC.